In a testy Oval Office exchange with the two top congressional Democrats, Rep. Nancy Pelosi and Sen. Chuck Schumer, President Trump made clear he would be “proud” to shut down the government in less than two weeks if he doesn’t get funding for his border wall. “I’ll be the one to shut it down. I will take the mantle. 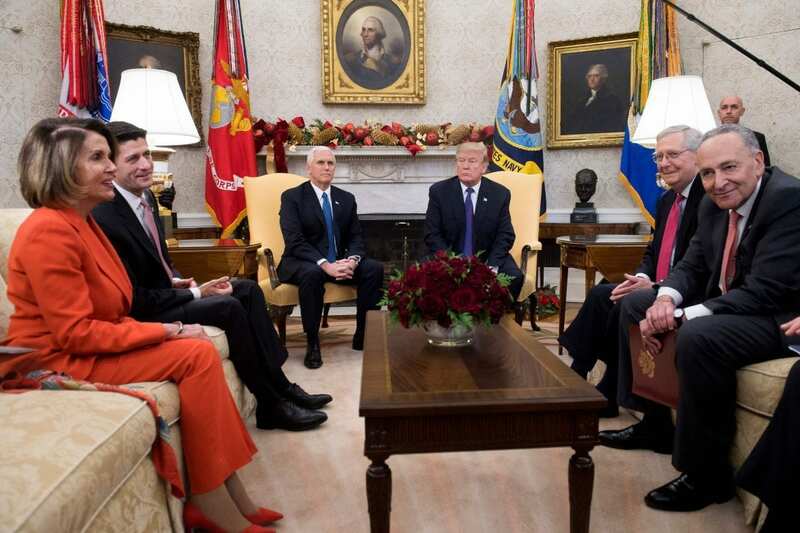 And I will shut it down for border security,” Trump told House and Senate Democratic leaders as Vice President Pence sat by stoically. Speaking after the meeting, both Schumer and Pelosi thought they had emerged with the upper hand after seemingly baiting Trump into taking the blame if there’s a partial shutdown just days before Christmas. “This Trump shutdown, this temper tantrum he seems to want to throw, will not get him his wall,” the Senate minority leader told reporters outside the White House. Throughout the meeting, Trump kept insisting that much of the wall has already been built (numerous fact checkers earlier this year determined it hasn’t, which Schumer pointed out) and he’s also said that the military can build the rest. During the 2016 campaign, Trump kept claiming that Mexico would pay to build the wall, but he has since dropped that talking point. Except by making that comment just after leaving the Oval Office, Pelosi was saying just that. She also kept trying to explain to Trump that there wasn’t enough support even in the GOP-controlled House for his border wall, urging him to accept a continuous funding resolution at the current spending levels, or $1.3 billion for a year. But Trump kept interjecting to shift blame, saying a House vote wouldn’t matter since he needs to get to 60 votes in the Senate anyway and that would require help from Democrats — a frequent complaint of his. Back on Capitol Hill, Pelosi told fellow Democratic lawmakers in private that she was “trying to be the mom” in the room. The tense exchanges underscored the challenges in the coming two years of divided government. Trump diverted from discussing Democrats’ takeover of the House, choosing to focus on GOP gains in the Senate — thanks, in large part, to a very Republican-friendly map in the 2018 midterms. “When the president brags that he won North Dakota and Indiana, he’s in real trouble,” Schumer jabbed. “Well, I did,” Trump retorted. Speaking on Capitol Hill, Senate Majority Leader Mitch McConnell, R-Ky., acknowledged it had been a “spirited meeting” at the White House, but that “I’d still like to have a smooth ending here” and avoid a government shutdown. “I’m sort of hoping for a Christmas miracle here that we’ll have a level of cooperation that we don’t normally have in getting bills across the Senate floor,” McConnell said, pointing to not just the government funding bill, but the farm bill and criminal justice reform. Democratic resistance to funding the wall may have prompted President Trump’s pre-meeting tweetstorm, which over a series of five long tweets seemed to simultaneously concede defeat and declare victory on wall funding. Troops have been stationed along the border since just before the midterm elections, and while some are being extended through the end of January, other units have been sent home. Even before the morning tweetstorm, in recent days Trump had been far less specific about his demands for border-wall funding than he has been in past rounds of budget talks. Sometimes he leaves out specific dollar amounts (though the standing ask is $5 billion). And his use of the phrase “border security” indicates more than just funding to build the wall. Democrats, looking at public opinion, may feel they have some leverage in the talks. A new NPR/PBS NewsHour/Marist poll out Tuesday shows that 57 percent of Americans, including 63 percent of independents, want the president to compromise on the border wall to prevent gridlock and not risk a government shutdown. Two-thirds of Republicans, however, want the president to stand his ground. And President Trump is often laser focused on his base. The days of high expectations for White House summits leading to bipartisan breakthroughs were well in the past even before Tuesday’s Oval Office throw down. A little more than a year ago, Trump had a couple of meetings with Schumer and Pelosi. He said he’d worked out a deal on immigration with “Chuck and Nancy,” as he called them. The sparring between Trump, Pelosi and Schumer may well be a preview of the next two years of divided government. Both Trump and Pelosi, who is expected to once again become speaker when Democrats take control of the House, have talked about the potential for bipartisan compromise on things like infrastructure and prescription drug prices. But they’ve also both foreshadowed conflict. This leaves many questions — are Democrats willing or able to compromise with Trump? Is Trump willing to deal? If he is, will congressional Republicans go along? And, given the way Trump has changed his mind in the midst of past negotiations, will anyone trust him? That’s one way of pinning blame back on the other party when big things fail to get done. Short also questioned whether Democrats would be willing to give Trump a win as he begins his re-election campaign in earnest. “[Pelosi] is going to be, and I think Democrats in the House are going to be, concerned with proving that they can be trusted that they can govern,” Lawrence said.